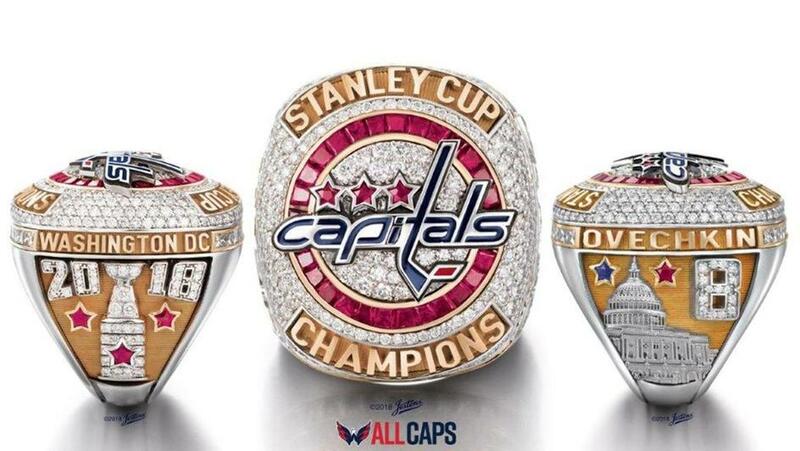 The Washington Capitals revealed their Stanley Cup rings on Monday and they're completely over the top and glorious just like their Cup celebrations. The rings are decked out in gold, diamond, rubies, and a sapphire, these rings are so flashy they're borderline blinding. The rings feature the Capitals logo on the top of the ring, with the while the player's name and number sitting alongside the Capitol Building. On the opposite side of the ring is the Stanley Cup with the year and the city’s name. On the inside of the ring are details of each playoff series en route to the Caps lifting the cup. In a nice gesture to recognise all that goes into winning the Stanley Cup, the Capitals presented matching necklaces to the player's wives and girlfriends. The Capitals will raise their Stanley Cup banner on Wednesday in their home opener against the Boston Bruins. No doubt fans will be able to see these rings from the Nosebleeds.